The Los Angeles Rams might have lost the Super Bowl to their arch-nemesis, the Patriots, but football life goes on. Operating from the domain TheRams.com, the NFL team doesn’t own its exact match .com, Rams.com. 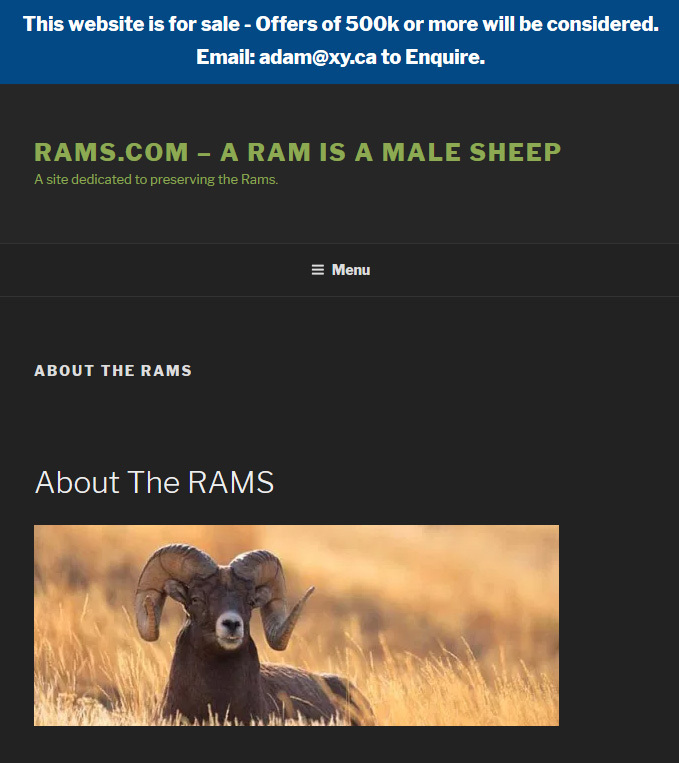 For several years, the domain Rams.com has been in the possession of Canadian domainer Adam Dicker, who was featured on ESPN saying that he acquired the domain for his “love of the animal,” the ram. Ok. We all know what the buyers of Cowboys.com think of that argument. Rams.com has been fluctuating in asking price, from millions of dollars, down to six figures and back up to $1.8 million USD. Sometime during the latest Super Bowl that The Rams played in, an asking price was added to the web site at Rams.com. This is an obvious statement about the domain’s worth and its apparent connection to something other than big-horned rams eating grass; no farmer germinating sheep would pay half a million or more for the matching .com, but an NFL team most definitely would. Still, the asking price is reasonable. Would the domain name Rams.com sell in the near future, unlike the rusty pants that Cowboys.com sit on?